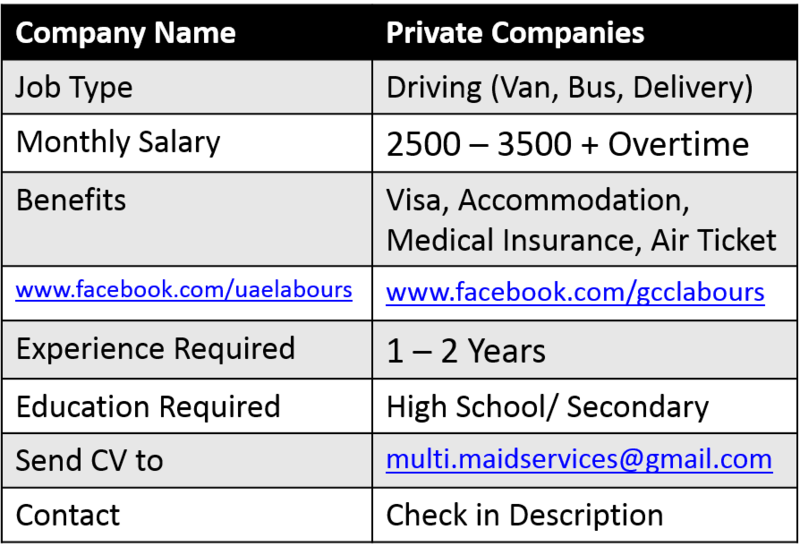 A Cleaning Company In Dubai Urgently Requires To Hire A Driver, Who Has Previous Experience In Cleaning Company. Must Have Full Knowledge Of Dubai Roads And All Locations. Must Have Good Spoken English skills. Nice and well manner person. Asian National will be prefer. Benefits: Free Visa, Air Ticket annually, Company Accommodation and Medical Insurance. Preferably Filipinos, others can apply too. Must be in UAE and any visa status. Benefits: Free Visa, Accommodation, Transportation, Medical Insurance will be provided by Company. Interview Date: 28TH December 2016. Interview Timing: 01:00PM to 04:00PM. Interview Location: OFFICE #1504, ARMADA 2, CLUSTER P, JUMEIRAH LAKE TOWERS (JLT), DUBAI. 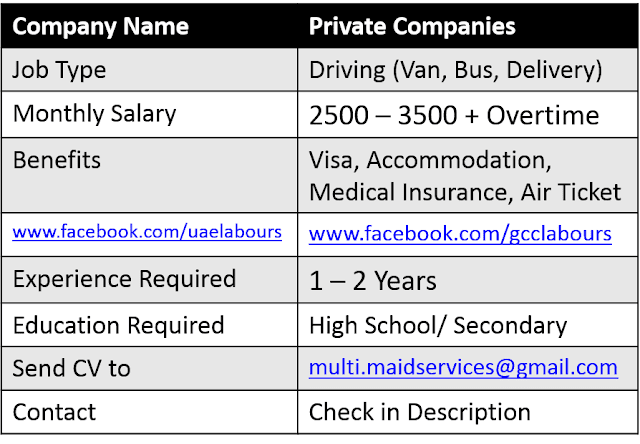 A Company is looking for Van Driver with at least 1 Year Experience on UAE Roads. 1: Plan and follow the most efficient routes for delivering & picking up shipments. 2: Load vehicles with shipments as per route plan & run sheet, ensuring deliveries are loaded correctly and taking precautions with hazardous fragile consignment. 3: Handle shipments properly in the vehicle and at the facility while following safety best practices. 4: Obtain proof of delivery and receive payments as per details on air waybill. 5: Update PDA according to shipment status accurately. 6: Ensure correct number of pieces are delivered and picked as per air waybill. 7: Report to station supervisor after returning from the field and ensure that all remaining shipments are updated in the system and handed over to coordinator, COD collections are remitted to cashier. 8: Maintain vehicle’s condition at all times and follow vehicle policy. 9: Wear uniform at all times while on duty and ensure that proper grooming is maintained. Benefits: Yearly Vacation with Yearly Ticket, Medical Insurance and Life Insurance. We Are Urgently Hiring For A Lady Driver Filipino For A Young Kid (Girl) To Pick And Drop Her Wherever She May Go. 1: Lady Can communicate very well in English. 2: With UAE Driving License. Note: Man Applicant No Need To Apply. Wanna make a career in Hotel jobs? Logon to our web portal dedicated to all the jobSeekers.